Greenbriar Picture Shows: Hail Their Conquering Despots? Axis partners of the future were all over US news and popular culture through the 30's. 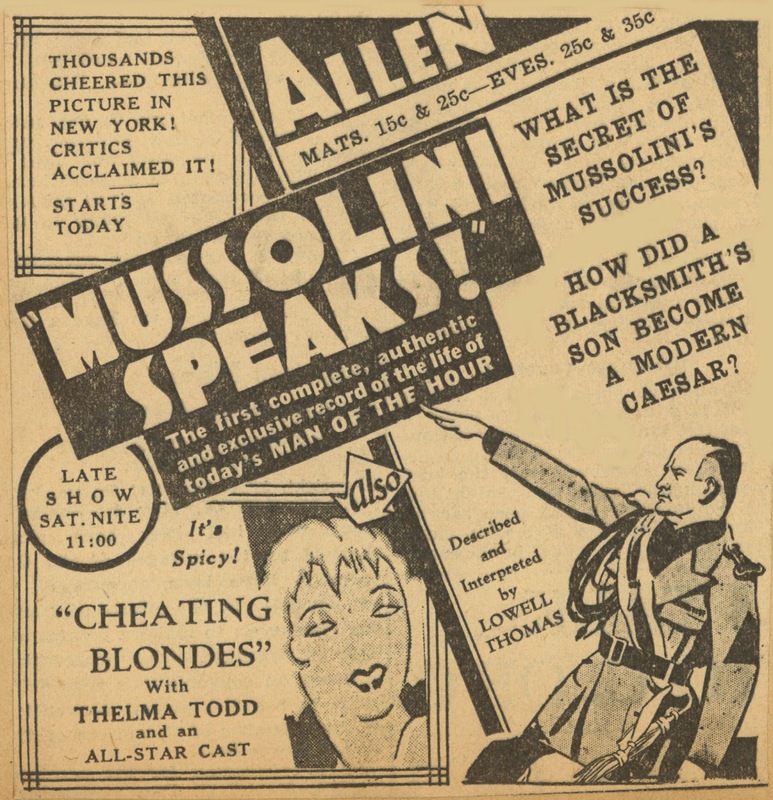 Hitler jokes turned up in cartoons even, and Mussolini took a ribbing by way of Sunday funnies caricature. Screwy part was, lots of folk really admired the puffed-up dictator, guest books to il Duce signed by Doug and Mary, Paulette Goddard, others among biz elite. There was juice enough to float a frankly admiring profile (feature-length) called Mussolini Speaks! (1933) from Columbia Pictures, whose chief, Harry Cohn, may have seen himself in mirrors as Benito (if not, then others surely did). Mussolini was viewed at the least as a get-it-done leader to uplift down-out nation that was Italy. More than a few thought as much of Adolph Hitler, who seemed to be licking single-handed a German depression. Where Mussolini Speaks! 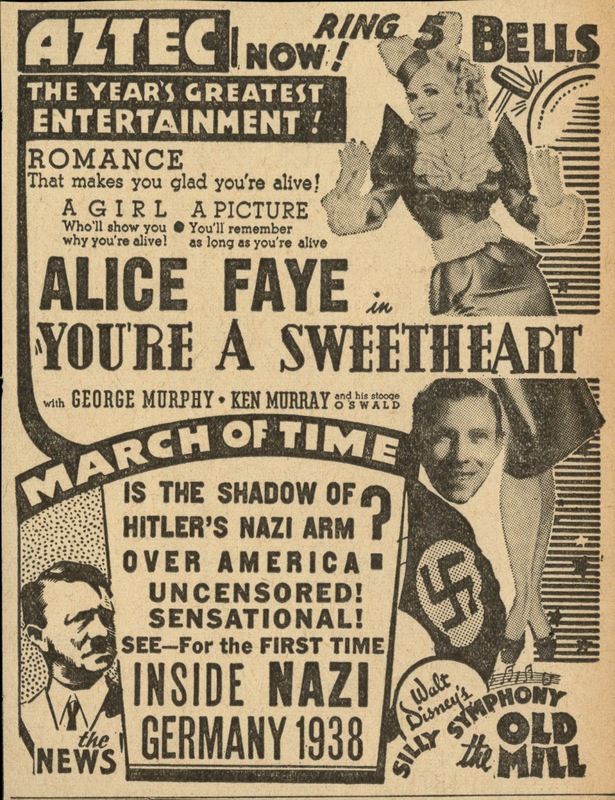 was a puff-job, however, Fox's March Of Time short, Inside Nazi Germany (1937), read Hitler in darker terms, casting the "Shadow" of his "Nazi Arm" over America. Movies were charged by the Code to tread light re politics/propaganda, but local ads could be, and were, frisky at peppering up sensation in newsreels. Sometimes that alone could sell a program, as maybe here where Inside Nazi Germany promises cold splash for an evening otherwise spent in formulaic company of Alice Faye and You're A Sweetheart. Would sock/shock value of the docu-reel plus Disney's visionary The Old Mill add up to value for tickets bought? I've got a feeling Alice was least recalled aspect of this visit to the Aztec. GREENBRIAR ON THE AIR: Showmen, Sell It Hot was featured recently on Ed Robertson's radio talk show, TV Confidential, wherein I'm interviewed at thirty minute length about the book and showmanship in general. The program can be heard at TV Confidential's Archive, being episode #240, with broadcast dates of July 16-21. Actress Diane Baker and screenwriter Paul Robert Coyle (as co-host) are also featured. Give it a listen and determine how well I'm able to disguise my rampant Southern accent. 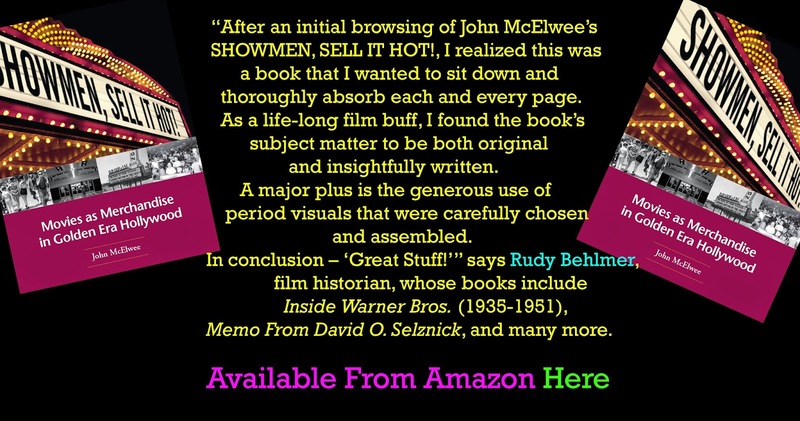 Also note below a recently received quote re: Showmen, Sell It Hot from eminent author/historian Rudy Behlmer. Someone posted a 10-minute clip of "Mussolini Speaks" on Youtube. It couldn't be more admiring; as Lowell Thomas says regarding one of Il Duce's superhuman feats, "This is a time when a dictator comes in handy!" Lowell presumably had to eat his words some years later. If Harry Cohn were still running Columbia, he'd have made "Putin Speaks." I bought your book, Jim. Loved it. So rare to come across something new and fresh in theme and approach and voice in film writing. An effortless, instant classic. Great interview, John! Hope the book continues to get plenty of exposure because, as I've said before, it's a must-have!